NETWORK FINALS: The CMA AWARDS lost 0.1 in final numbers. CABLE HIGHLIGHTS: ESPN’s NBA doubleheader led Wednesday cable at 1.14/0.92. On Comedy Central, SOUTH PARK returned at 0.68, and BROAD CITY was at 0.33. VH1’s BLACK INK CREW dropped 0.05 to 0.54, and an episode of MARTHA & SNOOP’S POTLUCK DINNER was at 0.27. Bravo’s REAL HOUSEWIVES OF NEW JERSEY ticked down to 0.42. TBS’s FULL FRONTAL rose 0.06 to 0.40. It was another tight race in cable news, with Fox News’s TUCKER CARLSON TONIGHT at 0.35/0.57/3.5M over MSNBC’s RACHEL MADDOW SHOW at 0.34/0.55/3M and CNN’s ERIN BURNETT OUTFRONT lagging behind at 0.26/0.34/1.1M. OWN’s QUEEN SUGAR slipped 0.02 to 0.33. Nickelodeon’s early evening SPONGEBOB was at 0.33. On ID, HOMICIDE HUNTER dropped 0.03 to 0.30, and UNUSUAL SUSPECTS was up 0.03 to 0.27. MTV’s ARE YOU THE ONE lost 0.03 to 0.24. On HGTV, HOUSE HUNTERS dropped 0.04 to 0.23, PROPERTY BROTHERS fell 0.13 to 0.23, and HOUSE HUNTERS INTL ticked down to 0.21. 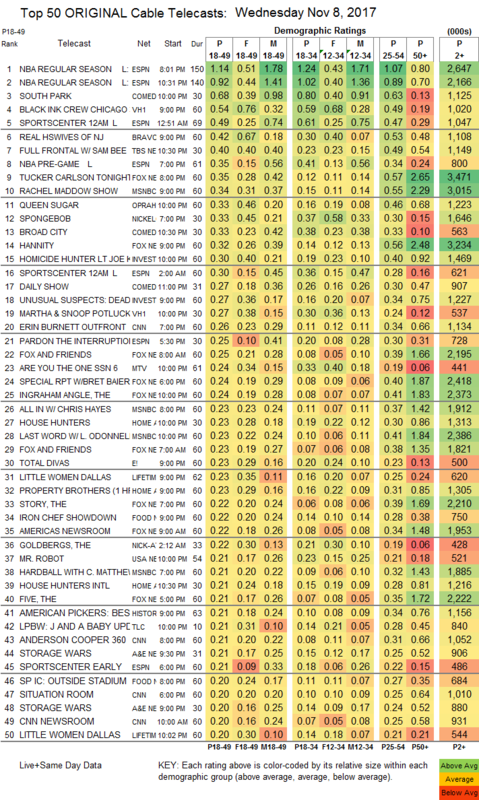 E!’s TOTAL DIVAS ticked down to 0.23. 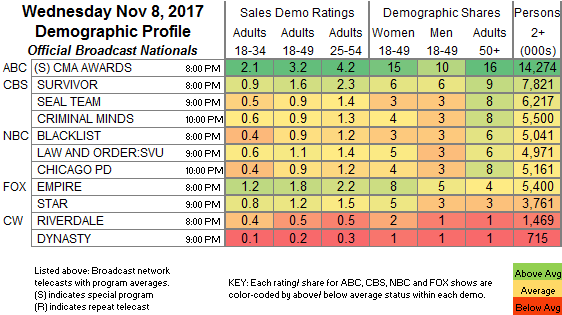 Lifetime’s LITTLE WOMEN: DALLAS was at 0.23/0.20 compared to last week’s 0.20. It was an all-IRON CHEF night on Food Network, with IRON CHEF SHOWDOWN at 0.22, IRON CHEF: OUTSIDE STADIUM at 0.20, and IRON CHEF BEHIND THE BATTLE at 0.18. A bravura episode of USA’s MR ROBOT ticked down to 0.21. A&E’s STORAGE WARS was at 0.21/0.20, and OZZY & JACK’S WORLD DETOUR returned at 0.19. FXX’s YOU’RE THE WORST ticked down to 0.10. On BET, 50 CENTRAL and FACE VALUE were at 0.10/0.10, each up 0.02. Spike is now burning off THE SHANNARA CHRONICLES two at a time at 0.09/0.08, compared to last week’s single episode at 0.07. IFC is also airing doubleheaders of STAN AGAINST EVIL at 0.06 and an off-chart 0.05/155K, compared to last week’s 0.06/0.05. The season premiere of Sundance’s THE A WORD was off the chart at 0.01/40K.